GUISELEY ended Stockport County’s 10-game winning streak thanks to a goal from on-loan Sheffield United defender George Cantrill, whose second-half strike secured a 1-1 home draw – the Lions’ 13th in the league this season. Guiseley entered this game just a place above the drop-zone, while their opponents knew a win could have moved them to within a point of top spot. Guiseley joint manager Russ O'Neill. The visitors thought they had taken the lead early on, when a well-worked free-kick was headed in by Ash Palmer, but the linesman ruled the effort out for offside. County continued their bright start, with Matty Warburton seeing his effort from just outside the area well saved by Marcus Dewhurst. 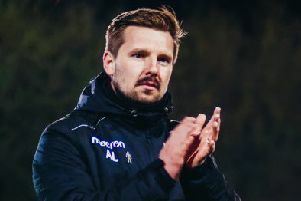 Guiseley had a fine chance with half-an-hour gone, as Rowan Liburd delivered a cross that was fumbled and ex-County striker Kayode Odejayi had an open goal to aim at, but his shot was deflected wide from Palmer. Just before the break, Stockport took the lead, good work by Warburton led to him having a shot that past several players, it was saved by Dewhurst, but he couldn’t hold onto the shot and Darren Stephenson had a tap-in from three yards out. It was more of an even start to the second half, with Guiseley soon levelling the scores, Cantrill started his run in his own half and after a one-two with Cliff Moyo, he placed his effort into the bottom left-hand corner of the goal. Guiseley would then go close to taking the lead, as a corner found Niall Heaton but his header crashed against the crossbar. In the end, both sides threw men forward but just couldn’t properly test each other’s keepers, as the game ended level. After the game Guiseley joint-manager Russ O’Neill said: “This is a good point against one of the best teams in the league, this is something we must build on. York City left it late to beat Ashton United 2-0 in a game where home keeper Adam Bartlett didn’t make a single save. Jordan Burrow took his season’s tally to 17 as he struck in the 83rd and 89th minutes. Burrow eventually broke the deadlock when a tame 15-yard effort squeezed past on-loan Burnley keeper George McMahon and into the bottom corner. But the ex-Halifax striker’s second goal was a more stylish effort as he exchanged passes with Wes York through the left channel before curling into the top corner from a similar distance. Elsewhere, Bradford Park Avenue’s away clash at Spennymoor Town was postponed due to a waterlogged pitch.